Discussion in 'Player Reports' started by CoolKidPlayz, Feb 14, 2019. Nope that's it XD first I get false banned by the owner, then I ban evaded as I thought getting false banned was unfair. Got that alt banned now I join back and I get banned for 6 DAYS??? nah that's it. I want to say ill miss Doobaa and the other staff that weren't a big jerk.Im pretty much probely not coming back in a month because at this point I don't find it fun anymore.Anyways yea, I did get banned and I think its unfair.Also I litteraly have no idea how to screenshow normaly so now people are gonna think im a hacking scumbag loser.Tree182 probely false banned me because he never saw real skills in pvp,it looks like this server was probely for people no on my pvp skin level, as im not cheating this time and still get banned while the rest of the cheaters that are blantant af are still cheating.At the same time maybe this is good.I get false banned without cheating and I even have proof of me using badlion in my other reports so if that's not a lot of evidence ill just wait my false ban this time.As of right now im afk in the bedwars lobby because I cant even do /hub because it says "Ban Evade" when to be honest the first ban wasn't fair at all so why whould the second ban be fair? https://i.badlion.net/3M65aNyBhLG8Rmfp4RN8rT.png the only screenshot I can give. 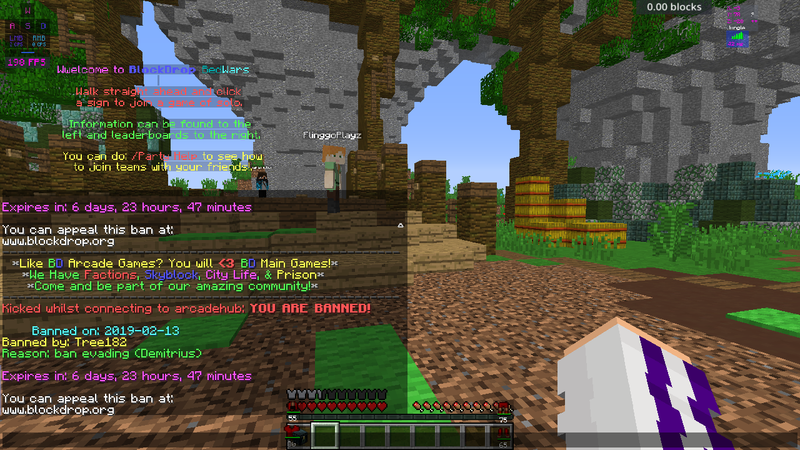 Well maybe Tree182 whould put and anticheat so people wont get false banned because im pretty sure im not the first one to get falsly banned and accused of using cheats. Also To Add on, I was using badlion a free client that proves im not cheating,so theres no possible way I can be cheating if im using badlion.if people still think I cheat after that then theres nothing I can do. You were ban by tree first time on coolkidplayz then you ban evade that by going on Demitrius so i had to ban that account for ban evade and from the looks of it you ban evade again by going on coolkidplayz when your alt demitirus is still ban you should of just waited out the ban and as for it being unfair bans you need proof thats its a unfair ban then maybe just maybe you might get the answer you are looking for. CounterTerrorist and H3LL0 like this.